I made an easy casserole dish tonight and I actually used frozen chicken instead of canned… Whoop Whoop! Although, I think you could substitute the canned meat just fine. If you do, be sure and drain the juices off thoroughly when opening the can, or your dish could be a little on the soggy side. I typically break out a can of Manwich if I have a craving for Sloppy Joes, but as The Kid so eloquently puts it, “MiMi’s is better”. So, I’m leaving the canned stuff in the pantry and making it the way my mom does! Guess what… only 3 ingredients! 1. Brown meat and drain off the fat. 2. Add Tomato Sauce and water. 3. Stir and let simmer, uncovered, for about 30 minutes. 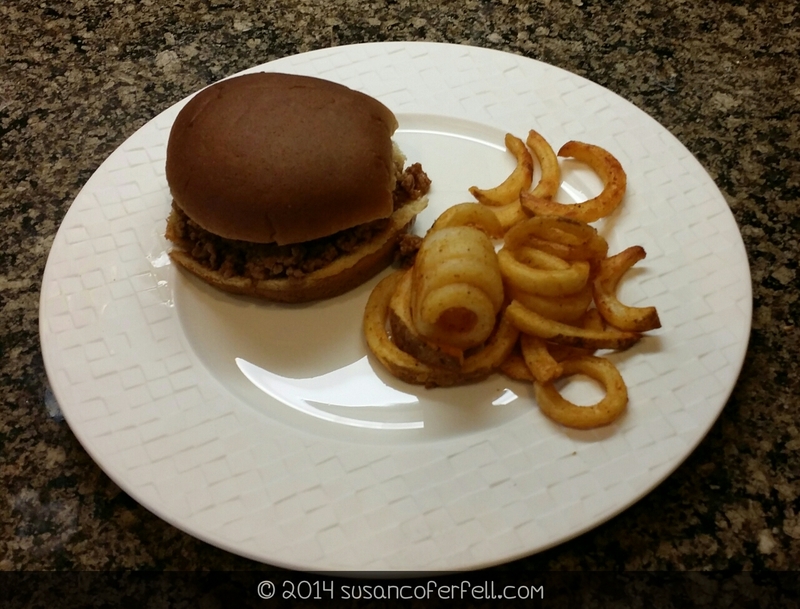 Serve on a regular hamburger bun or slider. That’s it! I also heated up some frozen fries for old time’s sake. Mom used to serve tater tots, but I couldn’t find a bag smaller than the family size at Wally-World yesterday, so we got seasoned curly fries. 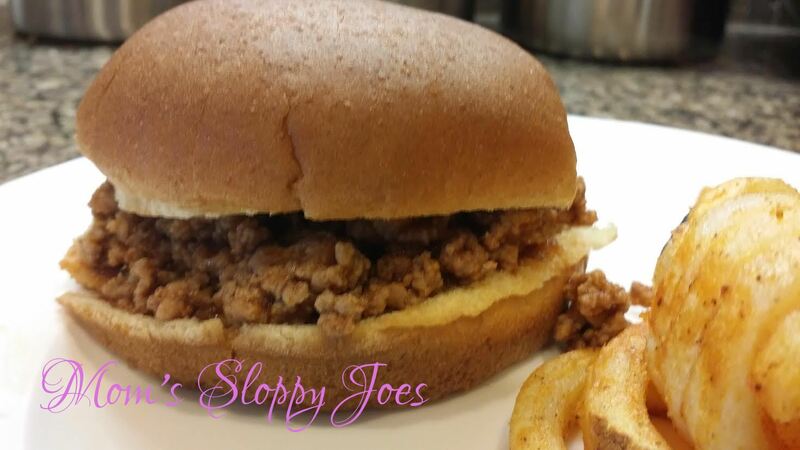 The Kid was in Sloppy Joe heaven! 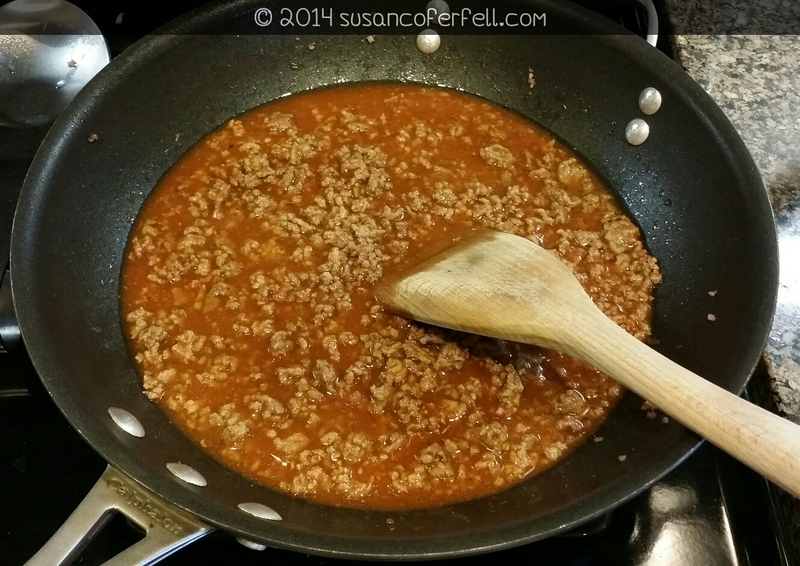 This meat mixture freezes well and also makes a yummy spaghetti sauce! 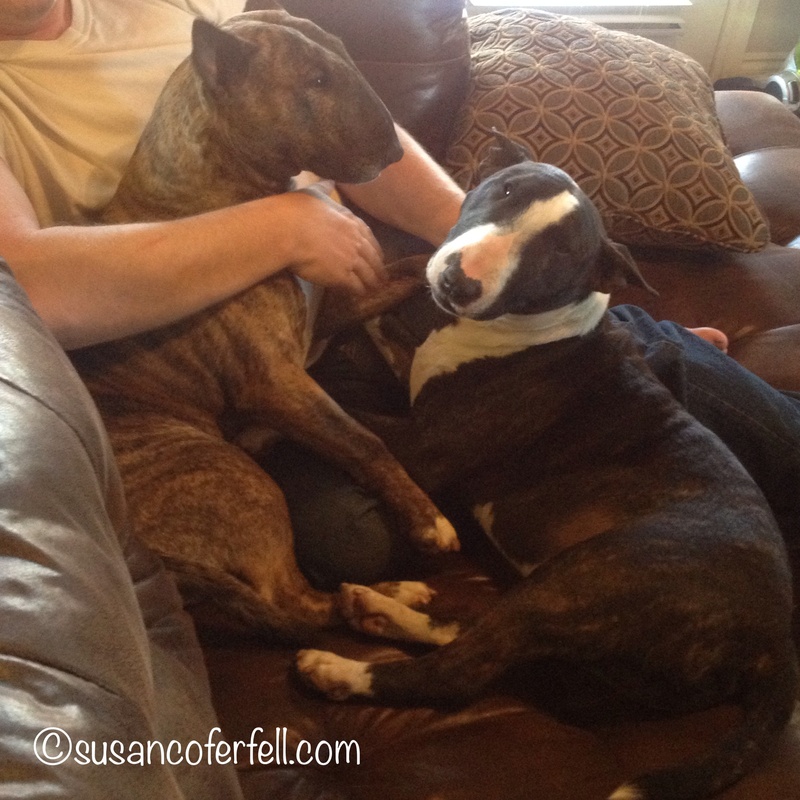 The first is, of course, our precious bull terriers, Macy and Rossi… We’ve had Rossi for nearly 2 years. It’s taken this long for these puppies to want to be so close! I’m sure it doesn’t hurt that they’re both trying to be as close to the Hubs as they can get! They are such sweet doggies! 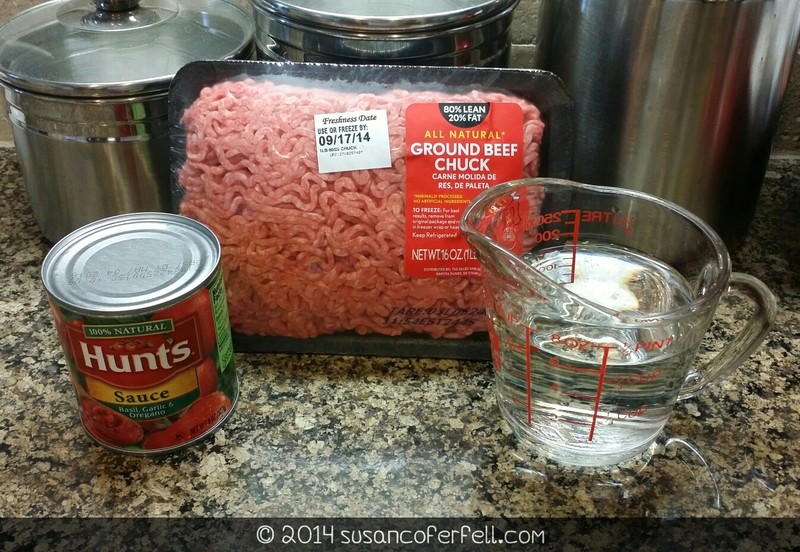 Melt the butter and stir in the Italian dressing mix to make a coating. Dip the chicken in the butter mix and turn to coat. Place chicken on foil lined baking sheet and bake in a 400 degree oven for 30 minutes until cooked through. 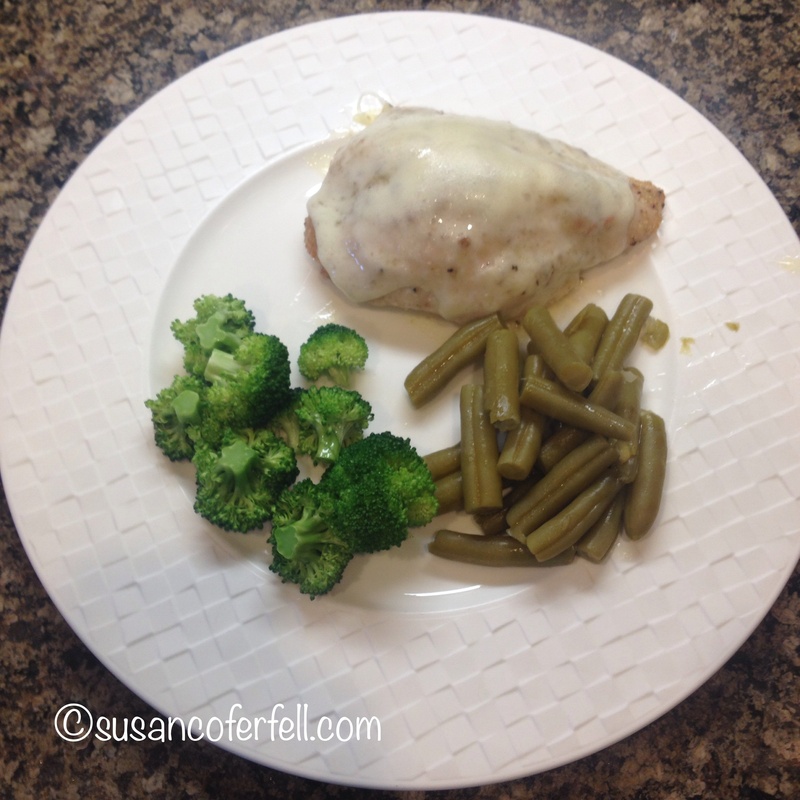 Place one slice of provolone cheese on each chicken breast and bake for 5 more minutes until the cheese is melted. I’m really excited to share with you what I cooked for my family tonight! It was such an easy and delicious dish… even Connor raved about it! I waited until the family was nearly finished before I told them it was “skinny”! I found the recipe on a website called “Skinny Mom”. HERE‘s the link to the recipe and HERE‘s the link to the homepage. Browse the website, it’s full of information just for moms. Their tagline is “Where moms get the skinny on fitness, food, fashion and family”. Topics range from exercise routines, meal planners, family advice and current fashion trends. They have giveaways all the time, too! 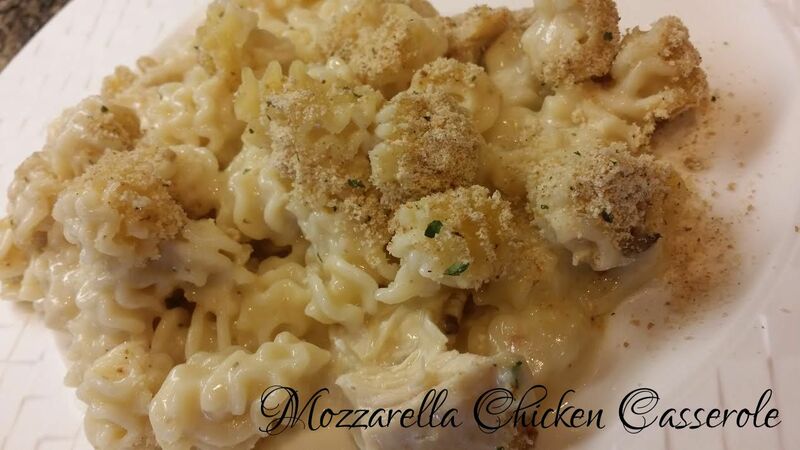 I love going there for different, delicious recipes and I encourage you to check it out! I wonder what I’ll be cooking next! !